the closing date of 28-02-2019. Those who qualified Degree and having 6 months computer knowledge certificate they can submit application form in a prescribed format to Unakoti District Court. Candidate’s selection will be based on written exam or computer knowledge test/skill/typing tests and document verification for these Lower Division Clerk jobs of Unakoti District Court recruitment 2019. 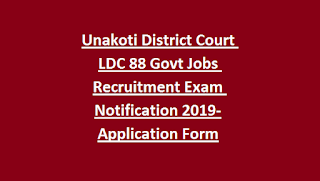 There are total 88 LDC Posts in this Unakoti District Court recruitment 2019. For general candidates age limits are 18-40 years. Upper age limit is 45 years for reserved candidates. Degree qualification and minimum 6 months computer knowledge along with 30 wpm typing speed in English is required to submit the application. Fee for this Lower Division Clerk application is Rs.400 for general and Rs.200 for reserved candidates. Candidates selection will be based on written exam, typing test and interview for this Lower Division Clerk jobs in Unakoti Court recruitment 2019. Written exam will be conducted for 85 Marks. Exam syllabus will be General Knowledge & Current Affairs, English, Mathematics. Computer Typing Test-This test will be conducted to know the candidates typing speed. 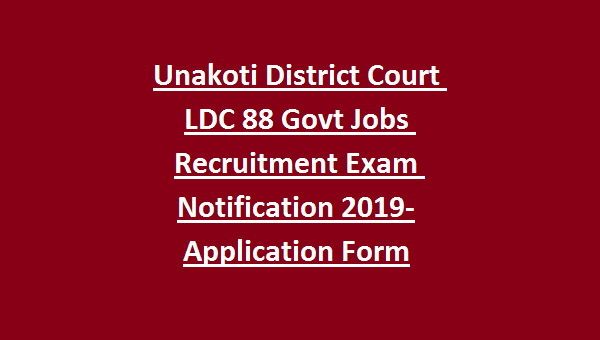 Candidates who are interested in these LDC vacancies they can apply in a given format for this Unakoti District Court recruitment before the last date of 28-02-2019.